I wrote this post about how the visible physical appearance of a junction should emphasise the legal priority that exists (unlike in the UK where design often contradicts priority). But while clear visual priority is an essential part of junction design, it’s merely a way of emphasising the legal layout. It is not enough to create a safe junction on its own, as David Hembrow explains here. I’d like to discuss something which is often done wrong: priority. I’m not talking about the legal sense, but the visual sense. We need to change the way we think about minor junctions. You see, you can have all the laws and paint you want, but if a junction looks like the cars have priority, then drivers will take advantage. Let’s ignore the many, many failings of this poor-quality cycleway (we’d be here all day) and concentrate on how the junction is arranged. The cycleway has priority here, but so many things suggest otherwise. The kerb-line, for example, curves around and across the cycleway. The yellow lines do the same, creating vagueness in priority. Note how there’s no kerb running along the edge of the cycleway as it crosses the junction, either – the carriageway is constant, while the cycleway is interrupted. This is a confusing mess. Considering that many, many more people will walk across this junction than drive across it, it’s crazy that the footway isn’t also continuous. These conflicting signals are often designed in by whoever draws up these plans. Perhaps the belief is that people will follow the rules like robots, ignoring things like kerb lines and parking restriction markings. But people don’t work like that, and this junction is unclear and dangerous as a result. People cycling along this road have priority at this junction, but does it really look like they do? The asphalt surface of the carriageway is unbroken, the sweeping kerb (designed for fast turns by car) cuts across the cycleway, and the footway and cycleway both drop down to carriageway level. There’s no inconvenience at all for people in cars. There’s nothing but two fading, broken white lines to suggest to drivers that they should give way. Can those lines even be seen in wet weather? What about when it’s dark? This isn’t sustainable safety. It’s paying lip service to cycling and walking, and it’s the reason so many cycle campaigners believe cycleways to be dangerous at junctions. They’re right – badly-designed infrastructure can be dangerous – but that’s not an inherent flaw with cycleways, it’s simply bad design. Well-designed cycleways are proven to be safe. This is real cycle infrastructure, and real walking infrastructure – genuine, proven to be safe, tried-and-tested design, quite unlike the type of tokenistic rubbish we’re used to getting. Here, the whole area doesn’t look like a road, it looks like footway, with a cycleway running through it. It’s clear that this isn’t the domain of motor vehicles. Nobody is “on the road” when cycling or walking through here – quite the opposite, it’s motor vehicles that are guests “on the path”. The whole junction area is raised up to footway level (rather than people on bikes and on foot having to drop down to carriageway level) and motor vehicles must mount a ramp to enter the junction. This ramp, plus sharp corners, slows cars right down. It also provides better visibility between drivers and those whose path the drivers are crossing – nobody needs to look back over their shoulder. It works in all weather, 24 hours a day. Better, but still not right. This is better than some of the other examples, but still flawed. The kerb line cuts across the cycleway, so the surface is broken. The surface of the cycleway is different as it crosses the junction. The corner radius is too large. The footway should also have priority across the side-road. Not as clear as it could be. It’s better than the paint-only examples, but the kerb still guides your eye around the corner. It’s good that the surface is different across the junction, but it still looks like the road has priority. To a driver leaving the minor road, it’s clear that they do not have priority here, that the road is severed by the footway and cycleway. People driving have to drive up a ramp and over the cycleway and footway in order to pass through this area the main road. Anyway, I hope I’ve made the point. Failure to make priority clear and obvious is a design flaw which I see all the time, both in Berlin and back in the UK. To create truly inviting conditions for walking and cycling, highways designers must change the way they think about how junctions should look, and make a positive decision to make walking and cycling a clear visual priority. It feels as if cycling infrastructure in the UK is considered a Good Thing, as long as it doesn’t cost any money or inconvenience any car drivers. Given constraints like that, it’s little wonder we end up with misleading and ill-conceived ‘infrastructure’ like the above. Honestly, I find it a little depressing. Everything you’ve said is entirely correct, and yet it sounds like the kind of trivial nitpicking that doesn’t win any arguments(*). They’re going to resurface a cycle path near me, one punctuated every hundred yards by these kind of guess-who-has-priority junctions, and my insistence that this is useless/dangerous just sounds … petty and almost ungrateful. * Not to trivialise your reasoning at all – I just find most drivers are neither convinced nor especially interested. I know what you mean, it sounds pernickety but all these things added together make the difference between another crap cycling “farcility” and a top class cycleway. Angled kerbs, a smooth, level surface, clear junctions – all these things should be standard features, not optional extras for fussy people. Look at infra designed for motor vehicles – so much consideration is given to providing optimal infrastructure. Smooth curves, flat surfaces, well-lit signage, etc., and nobody remarks on it unless it’s missing, because they’re all just standard features. That’s what I want for cycle infra – good minimum standards to provide a good level of service to people who choose to cycle, and to enable those who don’t currently do so. I agree with the main point of your post. However, I am curious as to how to terminate the kerb line so that it does not run across the cycle path. Typically a more robust pavement base is used for the part of the space receiving heavier motorized vehicle traffic. Sometimes the pavers look the same on top but their depth is greater in the roadway section. It is important to separate these two independant sections to minimize movement leading to failure. The kerb is used as this separator (or that’s how i have seen/designed it in the past). I am open to new ways of designing to increase the visual priority of future junctions. The classic (only?) UK example of this seems to be Bromells Road – it’s actually shown in the CIHT’s document ‘Designing for Walking’ – look up ‘blended junction’ or ‘continuous footway’. Presumably the local highway authority (Clapham?) will have details of construction depths and transitions. is this the actual junction? That’s the one…damned Google Maps Lite. If you look closely at Bromells Road, I notice that the stones used on the crossover portion of the footway are narrower than the stones used along the walking-only bit. I wonder if that has something to do with it? It’s definitely possible, as the Dutch have been doing it for years! Anyway, I shall see if the ones-in-the-know reply with more informed information. You just run the kerb along the line of the main road and where the area for pedestrians and cyclists crosses the side road, the construction specification is beefed up. 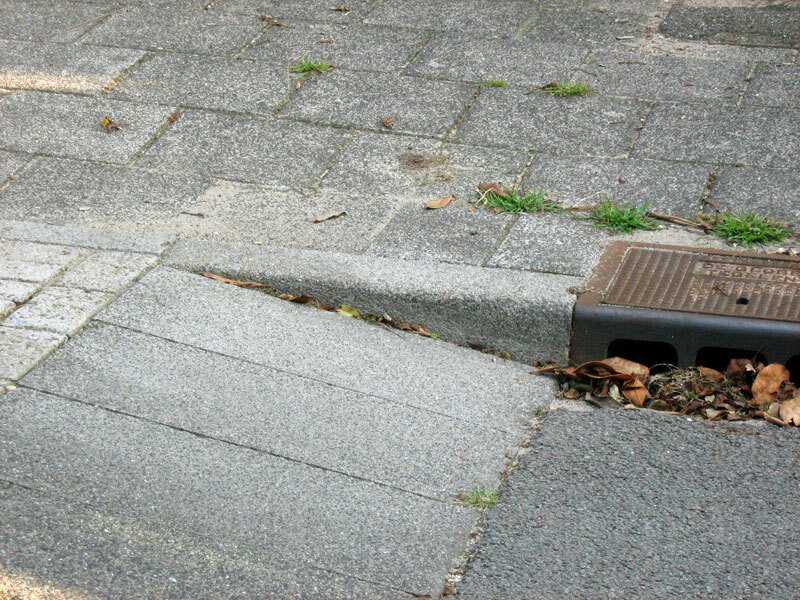 For example, if block paving is being used, then the footway/ cycle track might be 60mm thick on a certain thickness of construction then where vehicles cross over we would use 80mm blocks on a vehicle-class construction. One of the good bits about the Dutch arangement is that (due to the way the Dutch law is phrased) you don’t need ANY road markings and only a single sign (which doesn’t apply to motorists, anyway). the shared path remains at a higher level, yet the road junction itself still retains the sweeping curve for the motor vehicles and doesn’t slow them down when turning into the junction. Ugh… that could have been done so much better! As usual, despite the markings, most of the visual cues point to motor priority. Dreadful, dangerous design, which could be made good very easily. Thanks for the link! Also in the Netherlands traffic going straight on has priority over the turning traffic. A cyclist on the cycle path as seen on the 4th photo has by law priority over a car turning right. Also when the cycle path is non-continious as on the 3th photo. The same applies to a pedestrian: he/she has the same right: to continue with or without continious pavement. But in the Netherlands it is absolutely clear to everyone who has priority, and that priority is enforced physically. In the first photo as a Dutch cyclist, I would not take the risk and would give my priority away when a car is approaching. In the Dutch situation I (and all other people) do not even look at the approaching traffic or adjust speed. That’s a really good point – the actual laws might say this or that, but the design is what determines people’s behaviour more. The best example is probably at a standard UK side road, where turning drivers are expected to give way to people crossing on foot if they’re already in the road. Very few British drivers know this rule, and will honk their horn at people crossing, expecting them to run out of the way. With or without this rule, if the footway was uninterrupted and level, I’m sure drivers would give priority to people walking. I think the design actually trumps the highway code. 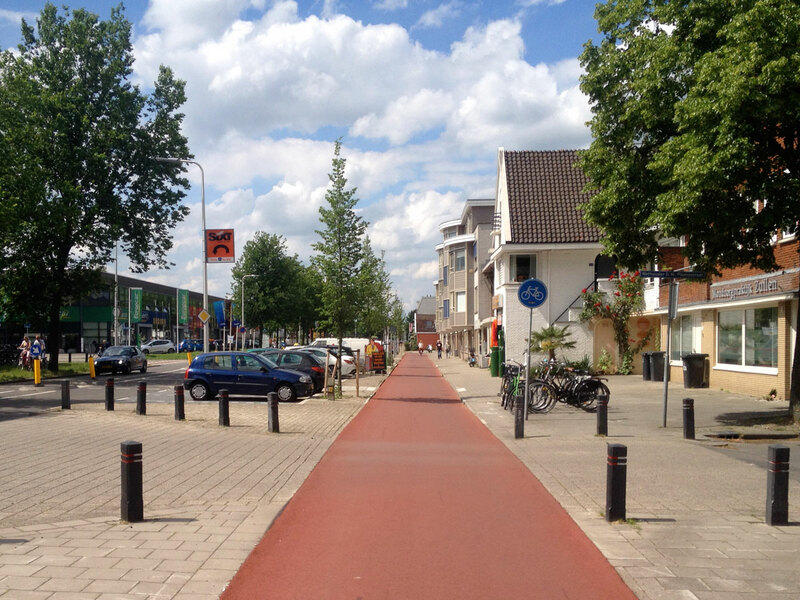 Cycling on a well-designed Dutch cycleway is lovely! In Berlin I’m constantly having to look all around me due to the awful design. Yes, cycling in the Netherlands is not bad and when I read your comments (or e.g. Rachel Aldred) I see why people from the UK think the Netherlands is a cycle heaven. Or when writing about almost daily near-misses, I think what are they talking about. I have had some near-misses but with low speed and about once a year or so and not only cars (my commute was about 50 miles per week, since last year about 75 miles per week in the Rotterdam area, a area not with the high levels of cycling as in Utrecht or Groningen). But people here don’t think so, they think the Dutch network, drivers not honking at you etc. is standard and not extraordinary. I’m being told that because pedestrians may walk on the cycleway, there needs to be kerbs/tiles across it to help blind/visually-impaired people identify the crossing. I’ve asked if the design should be different when the cycleway has priority else how can they tell… but I’d appreciate more UK examples, especially of unsegregated shared use crossings with priority, if there are any. Totally depressing: the Enfield mini Holland routes are being constructed and at side roads they will just raise the junction to the cycle path level and add paint and give way lines. The reasons for this are twofold: one is the material they are using will ‘wear’ if on the road apparently, so it is avoided (wrong material then), and two, supposedly we can’t have people on bikes be too ‘confident’ at junctions.